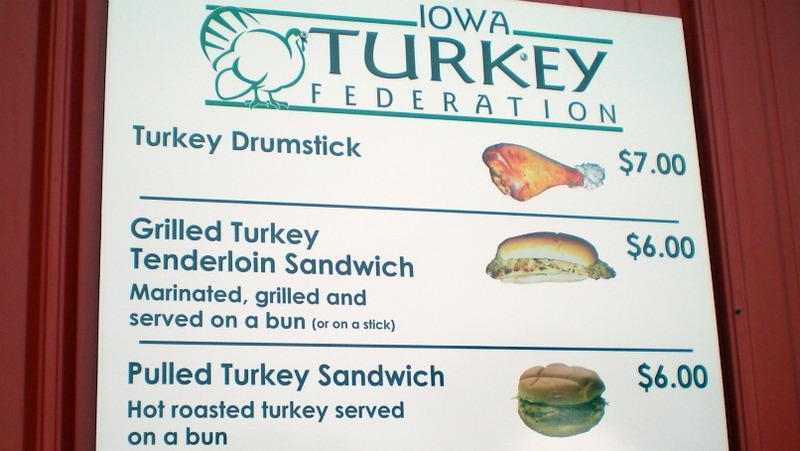 The Iowa Turkey Federation runs advertisements in local publications comparing a grilled turkey tenderloin to a breaded pork tenderloin, under the header named Healthy Choices. 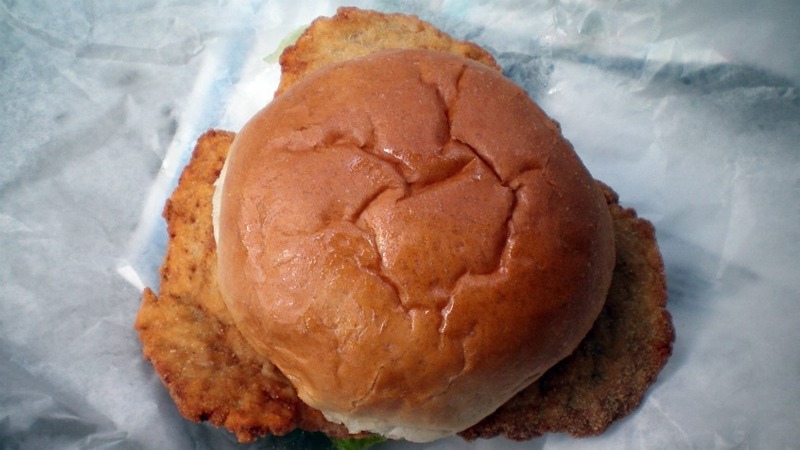 It makes the obvious point that the grilled turkey tenderloin, with its meat portion of only about 100 calories and less than 5 grams of fat per serving, is healthier than a breaded pork tenderloin sandwich. It strikes me as something of a false choice, because who really looks at these two sandwiches next to each other while looking at a nutritional label. 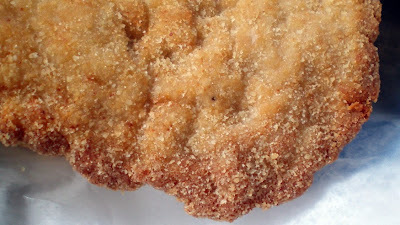 Without any good tenderloins to try at the fair, this was at the top of my list on a recent visit. 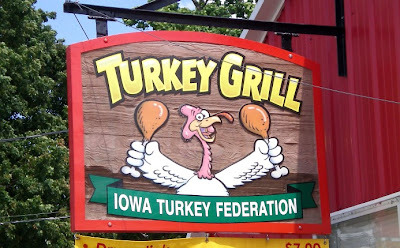 On another note, could the turkey in the sign look any happier while he is holding up two turkey legs? 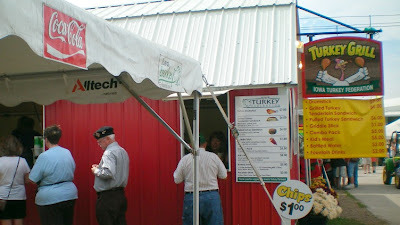 Location: On a path of food vendors between the Varied Industries Building and the Riley Stage at the Iowa State Fairgrounds. The Tenderloin: The turkey tenderloin is a cut of unused muscle from underneath the turkey breast. 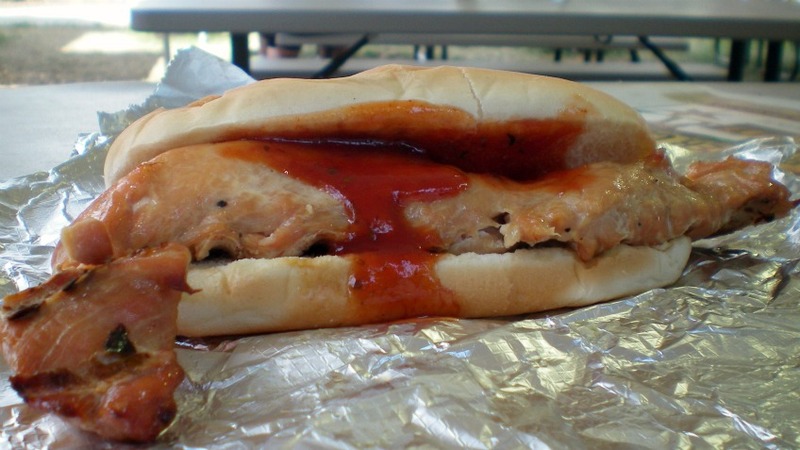 The meat is tender and lean, and entirely white beneath the surface. 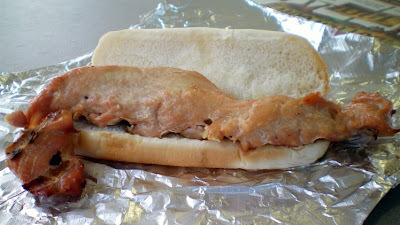 The marination leaves good moisture inside, and a little seasoning on the surface, but its not flavorful by any means. I topped my sandwich with some Kraft BBQ Sauce at the fixings table. 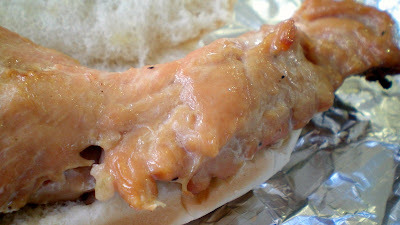 I can't help but think this would taste good if it were breaded and deep fried. 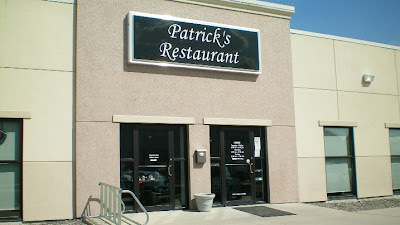 Service: You order at a counter, and pick up your food at another counter, the food is served up fast. 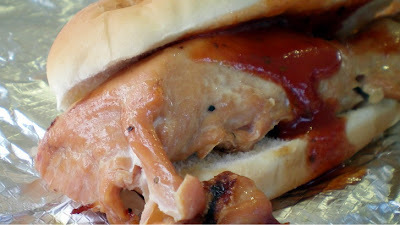 Ambiance: The Turkey Grill has two covered seating areas with picnic tables. The food is grilled behind the barn shaped building on multiple grills with Iowa Turkey Federation logos. The Griddle Sticks: These were at the bottom of the menu listed at $1, but they just came out of a Jimmy Dean frozen food box. 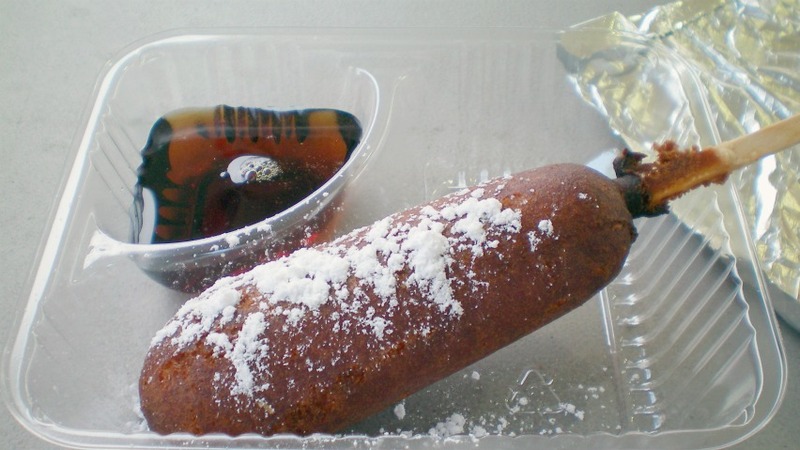 They are turkey sausage in pancake batter, and are served with powdered sugar and syrup. Not big, or special, but any food at the fair for only one dollar is an exceptional value. 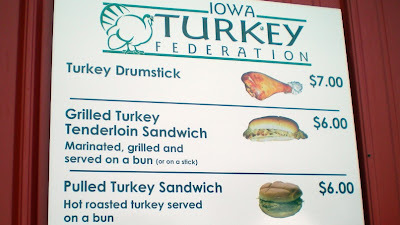 Final Thoughts: My travels around Iowa in search of Breaded Pork Tenderloins have only left one place that I remember for promoting a Grilled Turkey Tenderloin. That would be Jerry's Restaurant in Mt. Pleasant, so this is something you can't just find anywhere. If there are homemade pork tenderloin sandwiches at the fair, then I have not found them. 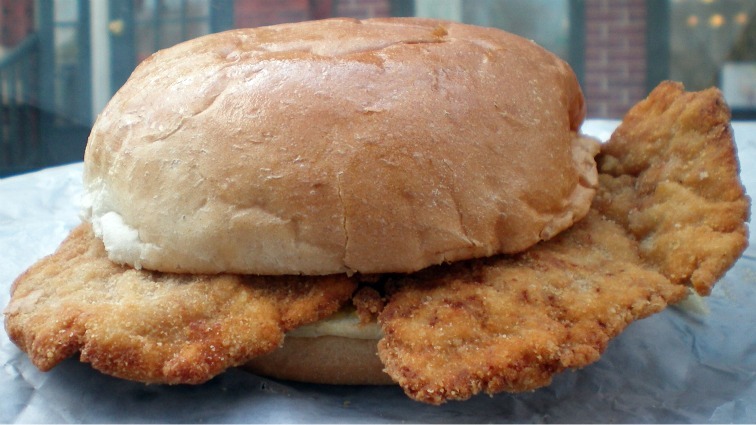 Multiple vendors offer the exact same pre-made "Half-pound Giant Tenderloin", but they all look unappetizing and overpriced. A few places serve a grilled pork tenderloin, but I just wish someone would serve a good breaded pork tenderloin at the State Fair.